The Dept. of Ecology does not plan to change fees, in-stream flow levels or require metering for new well owners in Whatcom County. 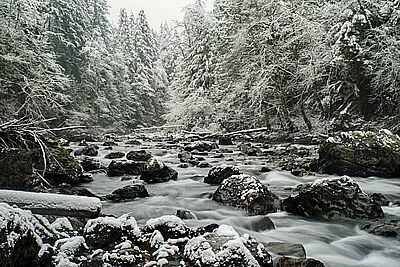 Ecology representatives met Feb. 22, 2019, with the Watershed Management Board for WRIA 1 – the Water Resource Inventory Area that includes the Nooksack River basin and Lake Whatcom – to discuss the next steps to meet the requirements of the Streamflow Restoration Act (ESSB 6091, now RCW 90.94). That law – known as the Hirst-fix law – ended a building moratorium on projects using permit-exempt domestic groundwater wells and required a Planning Unit to write a Watershed Management Plan Update for WRIA 1 and submit it to Ecology by Feb. 1st. The law says at a minimum, the watershed plan must include those actions that the planning units determine to be necessary to offset potential impacts to instream flows associated with permit-exempt domestic water use. After a year-long, what some described as a dysfunctional process and others described as intentional chaos, the Planning Unit process deadline came and went. Because they had not been able to finalize a consensus-ed vote to approve the update, the participants were left unsure if the state would take over the process or if locals could continue to give their input now that the deadline has passed. Ecology’s Mary Verner – Water Resources Program Manager – Ria Berns, Northwest Regional Office Water Resources Section Manager, and Annie Sawabini – Senior Rule Writer, gave a quick presentation on the overall rule-making process, incorporating local input, and the continued role of local participants in the process. Ecology will use a very limited scope of work with narrow sideboards as rulemaking must be done by August 2020. It’s the standard rule-making process, we’re just going to do it very quickly because the law tells us to. Ecology will use the work done by the Planning Unit and welcomes more local involvement. We are going to be using a lot of the work products that have already been done to help us … we are not starting from scratch in this rule-making. There has been so much great work done to date in this area. We want to make sure we’re going to incorporate that as best as we can. Ecology does not plan to change fees, in-stream flow levels or require metering. We are NOT looking at changing fees. It does look like you will have to codify the fee that was put forth in the law – the $500 fee – but we aren’t looking at changing fees. I will also be clear we are NOT looking at changing in-stream flow values. That is a very big scope of work with a lot of technical work and we do not feel we have the time. Rule-making will focus on re-timing high-water flow levels and withdrawal limits. We are NOT going to be considering metering. We ARE going to be considering withdrawal limits but that would be for new permit-exempt domestic wells, and we’re going to look at some re-timing of high (water flow) levels that we think could be used for mitigation on some projects. Ecology is not writing a Watershed Management Plan Update. The law tells us broadly the things we need to do is look at consumptive use of new permit-exempt domestic wells over the next 20 years … and we need to figure out projects to offset that water and come to a Net Ecological Benefit. We are intending to do all of that in some rule-supporting documentation. We are not making a Watershed Plan Update. That was not what we were directed to do in the law. The last decision that the WRIA 1 Planning Unit approved was its Dec. 12, 2018, decision to package and index the work that they were able to get done, and send a letter to Ecology and to legislators to inform them the plan update is not done but is still being worked on. The Planning Unit’s next meeting is scheduled for Feb. 27, 2019.